A big player in the UK gambling market their recognised brand will bring a welcomed sense of reassurance to new comers. Featuring nice instant bonuses. New users get a instant £50 sign up bonus and existing users get a £25 bonus on your first deposit of £25 , once a month. It is yours to withdraw after you have wagered 25x the bonus amount which is quite good. 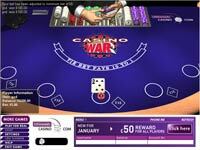 These bonuses are also ’Risk Free’ as you are able to wager with the casino’s bonus money first. Users are automatically included into their reward scheme which pays 1-3p for every £10 wagered depending on the game but are basically worthless to any player who has not wagered around £20,000. Featuring over 80 games, Littlewoods offers everything you could would want from an online casino including a couple of the less common games such as ’Let It Ride’ Poker and Pai Gow Poker. More recently they have introduced some impressive Marval themed Slots which features some classic Marval characters such as the X-men and the Incredible Hulk. There is nothing fundamentally wrong with Littlewoods range of games, however they don’t include some of the low edge VIP tables found in other Wagerlogic casinos. As with all Wagerloic casinos, Littlewoods uses Ecash Direct to process all it’s payments & withdrawals, accepting credit or debit. Cards. We recommend you use debit cards as it is the simplest method with the least hassles. If you were to pay by credit card, due to various regulations the casino can only refund the your initial deposit amount back to your credit card and any winnings/profits have to be sent to you by cheque. Withdrawals are prompt, usually taking around 3 days in our experience, but you must wait for a PIN before you can withdraw. Littlewoods charge £1 for making withdrawals (minimum of £25). You need a minimum of £20 in you account to make a withdrawal. Littlewoods offer support by both email and telephone (free phone). Enquiries relating to your account & banking needs to be directed to Ecash Direct (a subsidiary of Wagerloic). Being stuck in a the lengthy telephone queue can be frustrating, if the query is not urgent then correspondence by email is recommended as they will usually get back to you within a couple of hours (they promise within 24hrs).